Ahead of CES this year, Lenovo refreshed its lineup of ThinkPads with eighth-generation U-series processors. 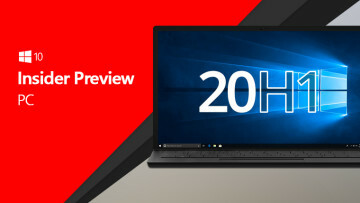 The new PCs come with a built-in privacy guard for the camera, USB Type-C charging that's designed for mechanical docking, and more. 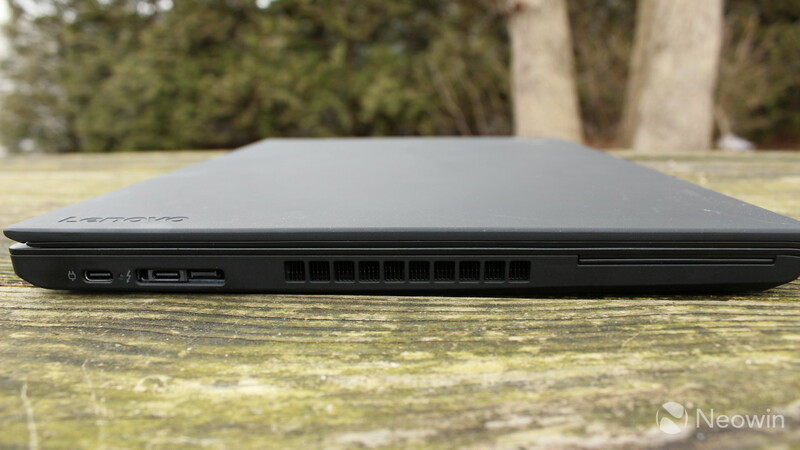 The ThinkPad T480 is considered to be the workhorse of the lineup. With a somewhat rugged design, users can hot swap the battery. There's an internal 24Wh battery, and an additional battery that comes in 24Wh, 48Wh, and 72Wh sizes. As long as that internal battery has a charge, you can swap out the external one without ever turning off the device. The ThinkPad T480 comes in a variety of options. You can get it with an IR camera instead of the ThinkShutter privacy guard, you can jack up the external battery to up to 72Wh, and you can configure the display with anything between WXGA and QHD. 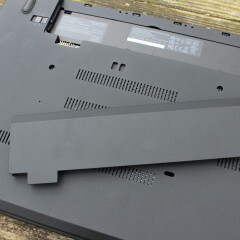 The Lenovo ThinkPad T480 is not designed to be thin and light, like so many other devices on the market. Made of magnesium hybrid and glass-fiber reinforced plastic, it has a solid feel to it. It's clearly meant to be dependable; with MIL-STD 810G certification, it can withstand extreme temperatures and humidity, shocks, vibrations, dust and sand, and high altitudes. On the bottom of the device in the rear is where the external battery compartment is located. As I mentioned earlier, you can get a 24Wh, 48Wh, or 72Wh battery, although it comes with 24Wh by default. When you buy the T480 though, it's not expensive to upgrade to a larger battery, at just $14 or $29 extra, respectively. It also has a 24Wh internal battery, so you can swap out the external battery without powering down the machine. On the left side of the device, you'll find two USB Type-C ports, one of which is USB 3.1 Gen 1 and the other is Thunderbolt 3. Both can be used for charging, but USB 3.1 Gen 1 only supports data transfer of up to 5Gbps, where Thunderbolt 3 supports 40Gbps. With the latter, you can power two 4K monitors off of a single port. The Thunderbolt 3 port on the ThinkPad T480 also supports side docking. 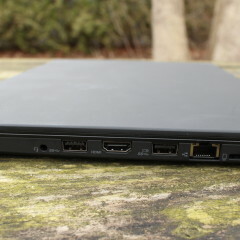 The ThinkPad Docking Stations allow users to connect to a variety of peripherals and displays. 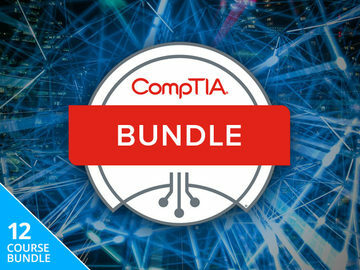 And then on the right side, there are two USB 3.0 Type-A ports, HDMI, Ethernet, a 4-in-1 SD card reader, a Kensington Lock, and a 3.5mm audio input/output jack. 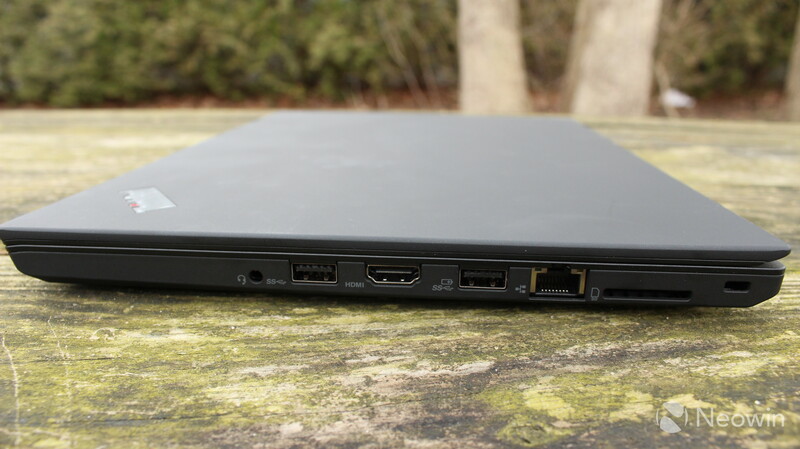 The wide selection of ports is certainly appreciated, and the ThinkPad T480 would have you ready for any occasion. 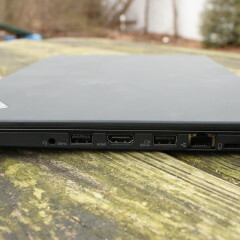 HDMI allows you to connect to external displays on the fly, and an Ethernet port allows you to have a wired internet connection. 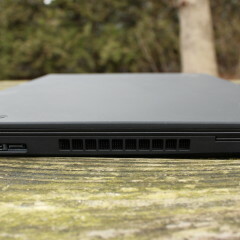 Other than that, the design is pretty standard for a clamshell ThinkPad. The round power button is placed to the top-right of the keyboard, and to the bottom right is a fingerprint sensor for Windows Hello. 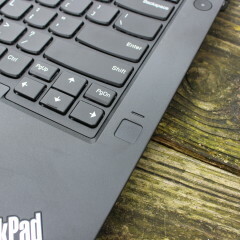 In the middle of the G, H, and B keys is a TrackPoint for navigation, and below is a trackpad and three physical buttons. The screen on the model that Lenovo sent me is a 14-inch 1080p non-touch IPS LCD. You can get it in 1366x768 or 2560x1440, and the 1080p model can be configured with multitouch. Personally, I don't miss the touchscreen on a clamshell laptop. Obviously, this wouldn't fly on a convertible where touch input is essential, but on a standard clamshell, I'm fine with a mouse, the trackpad, and the TrackPoint. It's an anti-glare display, which means that it has a matte look. It's not as pretty as glossy displays are, but it's great for getting work done in various lighting conditions. You won't have any problems getting work done outdoors if you need to on this one, although you might have to jack up the brightness. I think that as far as the resolution goes, the 1440p configuration is the sweet spot for a screen of this size. 1080p is okay, and it makes for some great battery life, but I think users will appreciate the extra pixels with a QHD screen. You'll notice that the device doesn't have the slim bezels that are found on many other premium devices, but it's also clear that it's not the goal of this machine to be pretty. 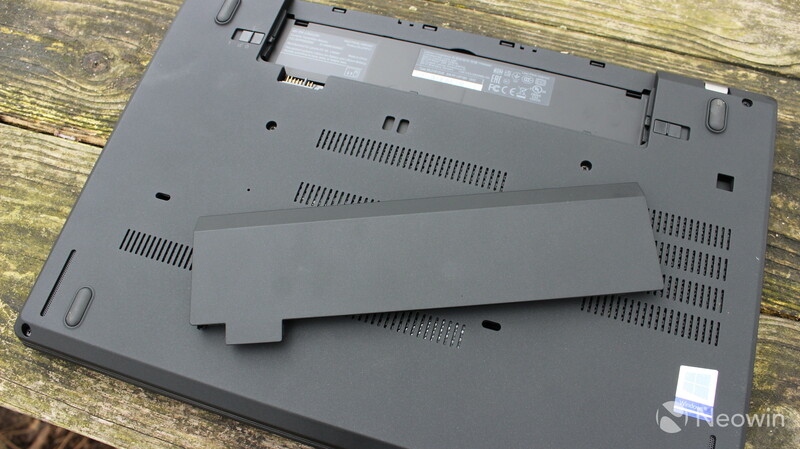 The ThinkPad T480 is clearly designed to be durable, so if you drop this device, the screen won't crack easily. If you read a lot of my ThinkPad reviews, then you know that there are just certain things about them that I always love. One of those things is the keyboard. I've never used a ThinkPad where I didn't love the keyboard, and the T480 is no different. Unfortunately though, it's not my favorite ThinkPad keyboard, although it still comes out above every non-ThinkPad keyboard. The key travels the same length as any ThinkPad laptop (convertibles tend to be a bit more shallow), and it's comfortable. The key resistance is just right. 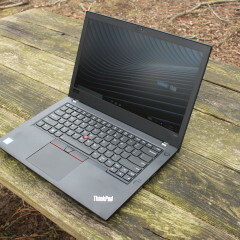 What I don't like about it is that it doesn't feel as soft as PCs like the ThinkPad X1 Carbon, or even the ThinkPad X280. The plastic keys and the glass-fiber reinforced plastic base aren't nearly as pleasant to the touch. 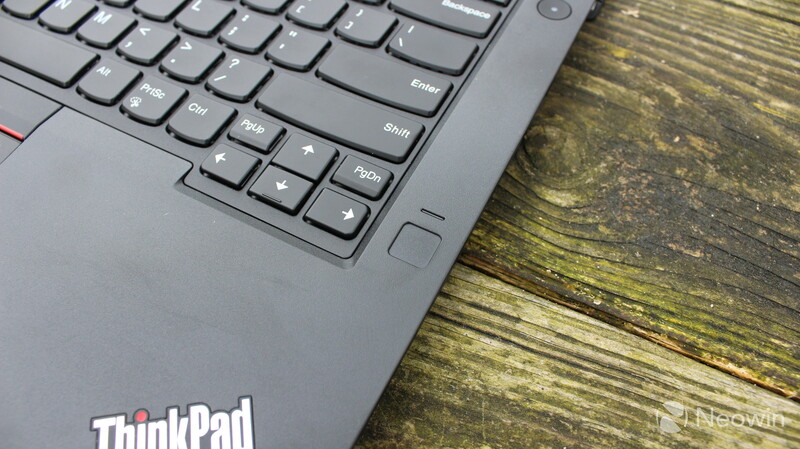 This is a difference that you'll only feel if you frequently use different ThinkPads; otherwise, it's an excellent keyboard, and it's still one of the best around. As always, there's a red TrackPoint between the G, H, and B keys. This controls the cursor, and you can use the three physical buttons beneath the keyboard to click. 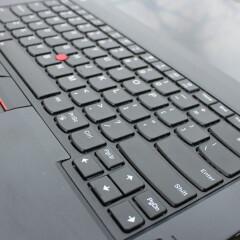 The center button is for scrolling, so you can hold the middle button and use the TrackPoint to scroll. And of course, there's the clickable trackpad below that. So, with the option of plugging in a mouse, you have three separate methods of navigation. 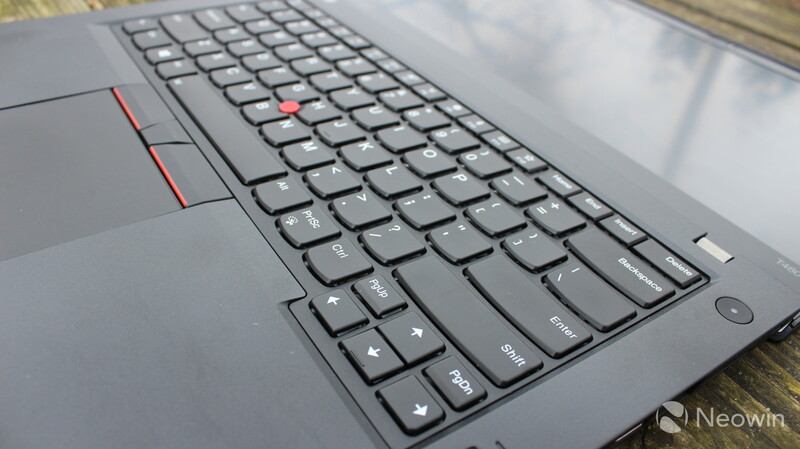 Lenovo's ThinkPad T480 includes a fingerprint sensor for Windows Hello. ThinkPads have offered fingerprint sensors for years, long before Windows Hello was even a thing. The sensor works as well as you'd expect, but what I really prefer for Windows Hello is an IR camera for facial recognition. It just feels more natural for me to turn on a PC and have it recognize me without having to take any additional action. If you're a facial recognition fan, I have good news and bad news. 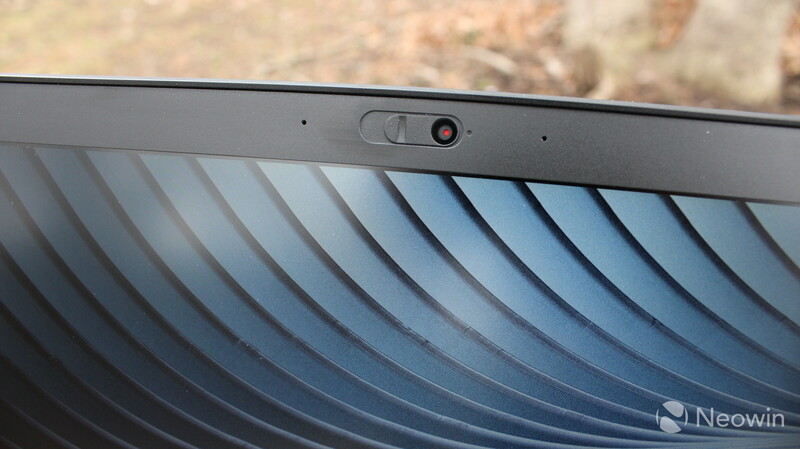 The good news is that Lenovo is finally embracing IR cameras with this year's line of ThinkPads. 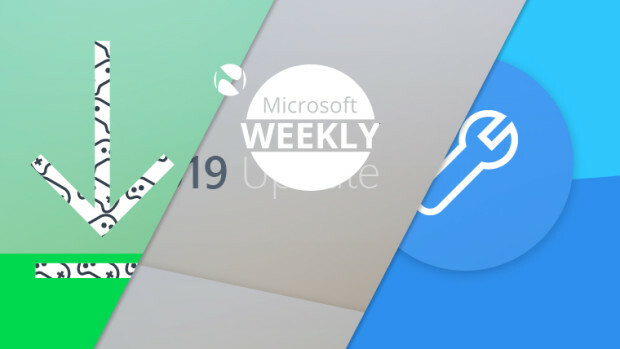 The bad news is that you have to make a trade-off for another great feature. 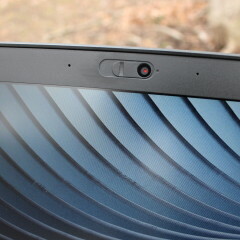 The company included a built-in privacy guard into all of its ThinkPad models this year, which it's calling ThinkShutter. No longer do users have to place a piece of tape over their webcam, as there's now a simple, mechanical switch. 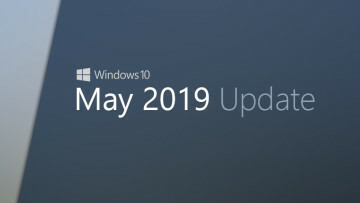 The only problem is that you can either get a ThinkShutter privacy guard or you can get an IR camera for Windows Hello. You can't have both. Still, if you're OK with just the fingerprint sensor, then you're good to go. As I mentioned above, the model that Lenovo sent me includes a 24Wh internal battery and a 24Wh external battery. I've found that the battery life with this configuration is excellent. With every day use, the T480 doesn't struggle to get between eight and 10 hours of battery life, and this includes working through the Chrome browser, and using other apps like Slack, Skype, OneNote, and Photoshop. When I tried to edit video and still work in Chrome, that time dropped drastically, but that's to be expected. 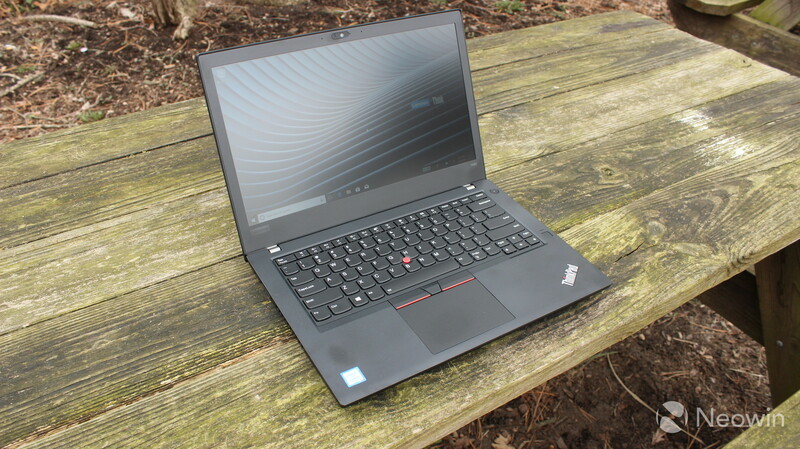 We'll talk more about how the T480 handled that in the performance section. But you can upgrade the external battery to 48Wh or 72Wh, for a total of 72Wh and 96Wh, respectively. That's pretty big, because that means that you can double the battery capacity from what I've been using, which means that you're looking at two workdays of battery life without having to charge it, possibly three. And if you have multiple batteries, you don't have to worry about charging at all, because you can hot swap them. Since it has a 24Wh internal battery, that will keep the PC powered on while you switch out the external battery for another one. Again, this machine is a workhorse. 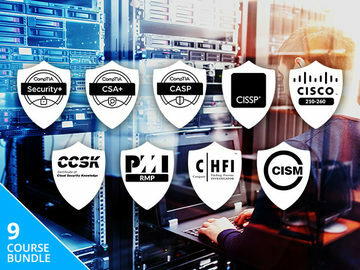 It's made to be dependable, and to do the things you need it to when you need it to do them. 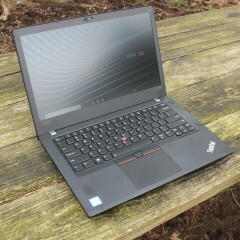 Overall, I was very pleased with the performance of the ThinkPad T480. It's an excellent machine. 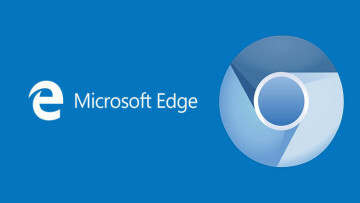 My general workflow includes having about a dozen tabs open in Chrome at any time, with apps like Skype, Slack, OneNote, and Photoshop also open. And the T480 performed brilliantly. That's not to say that it can handle anything though. I managed to get it to choke when rendering video and still trying to work at the same time. The video that it was rendering was 1080p 60fps, so maybe it would have done a bit better if I had the model with the dedicated GPU. 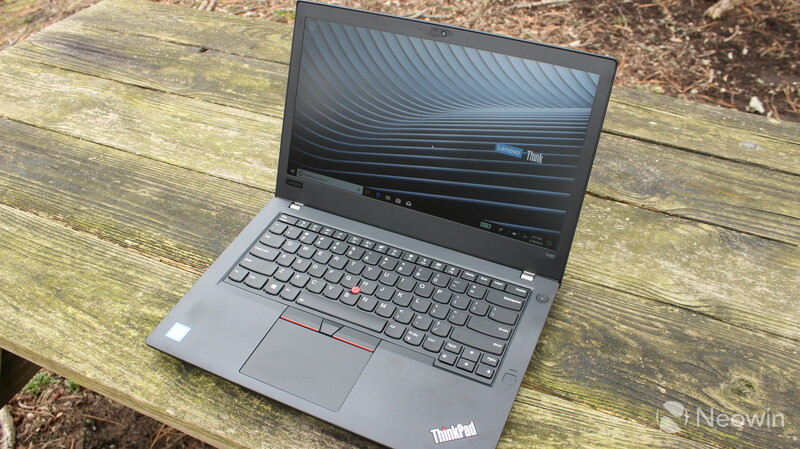 Still, if you're editing high-resolution video and working at the same time, you should probably be looking at a mobile workstation like the ThinkPad P71. 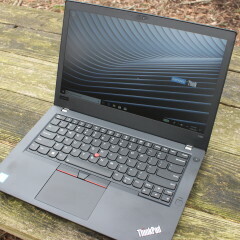 What I'm getting at is that the ThinkPad T480 is excellent for tasks that it's actually built for. This machine uses a Core i5-8250U processor, although it can be configured with an i7. The U-series is the typical CPU that you'd find in a convertible or ultrabook, and previous generations of it were dual-core. Now that they're quad-core, there's a significant boost in performance, especially if you run VMs or do other things that can take advantage of the additional cores/threads. As you can see, the T480 scores pretty well, considering that this isn't even the Core i7 model. Next up is Creative, which tests more GPU-intensive tasks like video editing, mainstream gaming, and advanced photo editing. The score for the Creative test is still pretty good, although it's not as good as PCs that have a dedicated GPU or an H-series processor. Finally, the Work test checks productivity-related tasks like writing and spreadsheets. 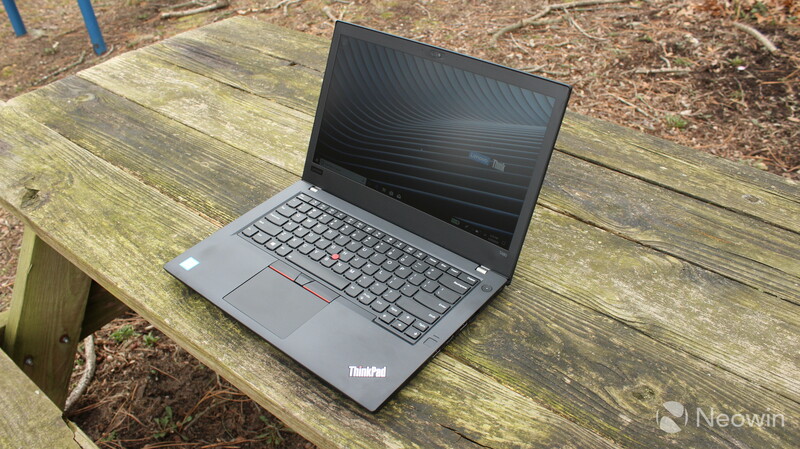 Obviously, the ThinkPad T480 does great on the Work test, which is no surprise. This machine is clearly engineered for getting work done. The Lenovo ThinkPad T480 is an excellent machine for a specific type of use case. It's designed to be a workhorse, to do what you need it to do when you need to do it. 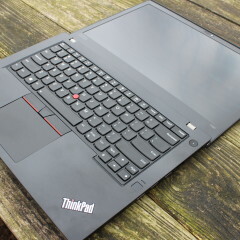 It's clearly more of a rugged design than other ThinkPads, and it offers a different feature set. 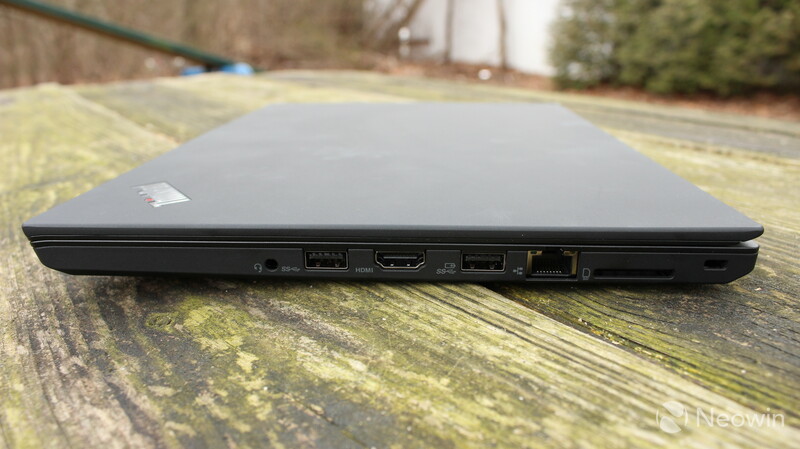 For example, the ThinkPad T480s offers similar features in a slimmer body, and the X1 Carbon is meant to be super thin and light. One of the key features is the hot-swappable battery, that you can put a new battery in the machine without ever turning it off. If you're out in the field and can't get to a charger, then this feature is critical. But the features that are new to this generation are USB Type-C charging, eighth-generation quad-core processors, and the ThinkShutter privacy guard. All of these are great. 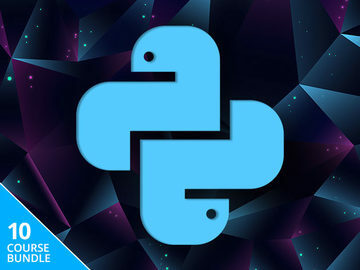 You can use the same charger that you do with other devices, the CPU is powerful, and you don't have to worry about putting tape over your webcam. My only real issue with the ThinkPad T480 is the same as most ThinkPads of this generation, which is that you have to make the choice between ThinkShutter and an IR camera for Windows Hello. 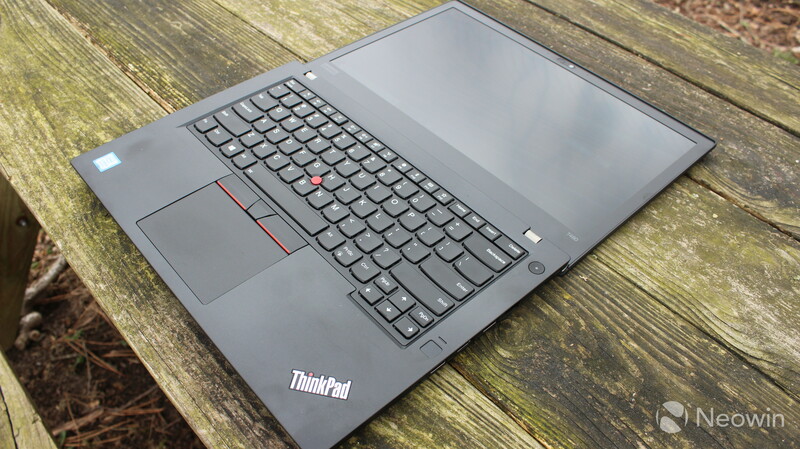 But if you're looking for a workhorse that you can use out in the field, or for a variety of tasks, the ThinkPad T480 is an excellent choice.